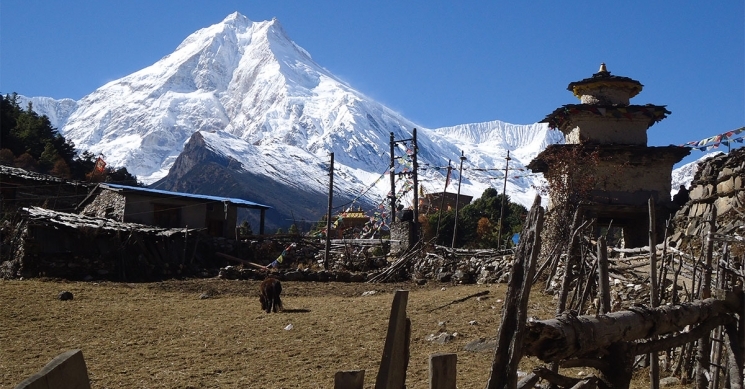 Manaslu Circuit Trek is off the beaten path trek in Nepal 17 days. An insight into Tibetan culture can be acquired through various monasteries and Tibetan settlements along with views of Tibet and mountain ranges. Bathing pools, lakes, and waterfalls surrounded by alpine and tropical forests are abundant as you pass through tea houses and enjoy home stays. The magical/mystical view of the mountains along with balanced ecosystems, rich culture and genuine adventure for trekkers as they climb to the base of Mount Manaslu makes the trek very special. 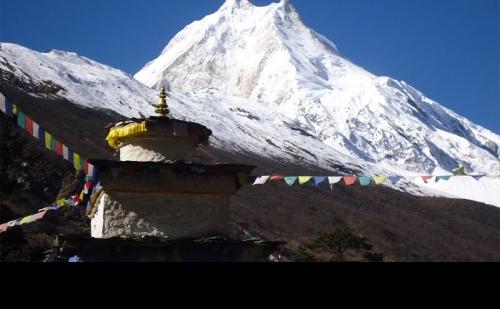 Manaslu Circuit Trek is categorized as one of the adventure treks in Nepal and combines the high of the Himalayas and its natural beauty with rich cultural heritage and biological diversity. Manaslu, located east of the Annapurna range which is the eight highest peaks in the world and was opened to foreigners since 1992. Manaslu Circuit is a laborious trek that demands experience along with good physical well being. The Manaslu trek ascends through Budi Gandaki River offering numerous rivers and waterfalls to Larkya La Pass (5213 m), the highest point in the Manaslu trek, providing striking views of Himalchuli, Manaslu (8156 m), Ganesh Himal and other various mountains. En route, diverse landscape and variety in flora and fauna amazes anyone. The laborious part of trekking along Manaslu circuit starts from Samagoan (3450 m) where you could get lucky to see the freezing green lake of Birendra. However, the biggest challenge awaits - crossing the snow-clad Larkye La pass (5213m), which is 8 km from the Tibet border, and offers classic views of Himlung Himal (7,126 m), Cheo Himal, Gyaji Kang, Kang guru (6,981m) and Annapurna II (7,937m). From Larkya La (Larkya Pass), we take a steep descent along a snow-covered trail down to Tanbuche. Then we follow a narrow trail to the Dudh Khola (White River) banks passing through magnificent forests of rhododendron, Pine, and Juniper. A further descent transforms the alpine vegetation to subtropical greenness. Then the walk through the Marshyangdi River to Besishahar marks the end of the Trek. 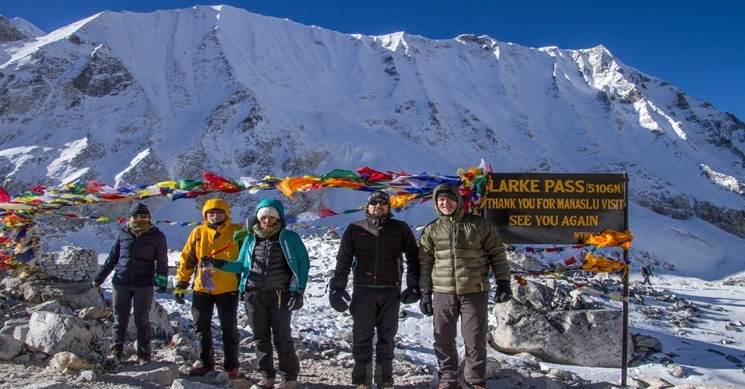 The 17 Day Manaslu Circuit Trek is getting more and more popular as a new trekking destination but it still sees fewer trekkers compared to the established trekking routes in the Annapurna region. 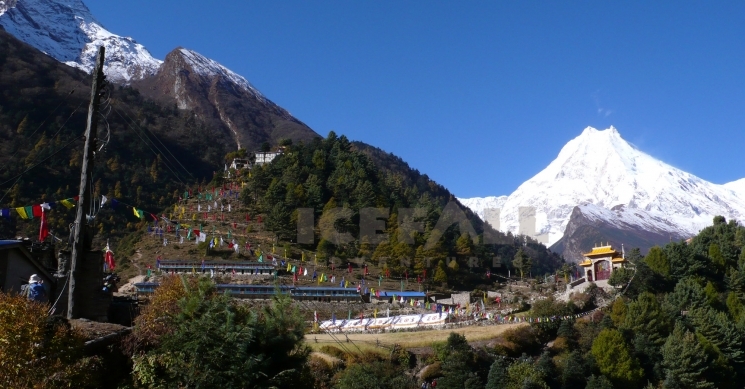 The circuit is a stunning trek with spectacular views of Mount Manaslu (8163 m) and the Ganesh Himal Range, among others. 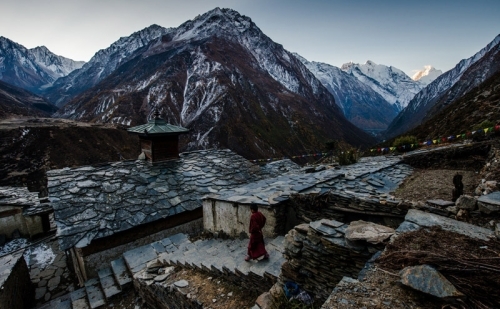 Along the trail to Manaslu Trek, you will cross an interesting mix of authentic Hindu and Tibetan-style Buddhist villages. The trail follows the spectacular Budhi Gandaki River all the way from Arughat to its source just below the Larkya Pass (5125 m). As you start low, at around 700 m, the landscapes are incredibly varied ranging from the green countryside and lush forests to spectacular high altitude landscapes skirting huge glaciers. The crossing of the Larkya Pass (5125 m) can be tough when there is snow. However, the stunning landscape with the mighty Himalayas towering straight above you and the spectacular glaciers make it more than worth the effort. The pass links the Budhi Gandaki with the Marsyangdi valley. The descent passes through beautiful alpine meadows at Bhimtang before joining the main Annapurna Circuit route heading to the trailhead at Besisahar. 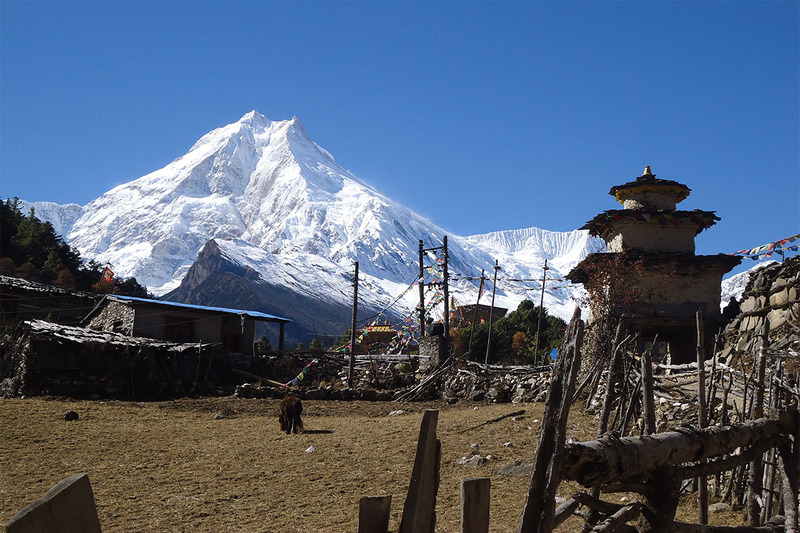 The Manaslu trek is easily accessible from Kathmandu. It originally started in the town of Arughat or Sotikhola; however, with roads being built many trekkers start at either Barpak or Soti Khola a bit further up the trail. The Manaslu trek described here starts in Soti Khola and ends in Chyamche. Its also possible to finish the walk in Besisahar which is also the starting point for the Annapurna circuit Trek. The itinerary below is one of the many possibilities. The trek can be made longer or shorter depending on the length of your walking days and starting point. There are basic guesthouses all along the trail so you can choose if you want to camp or stay at the teahouses. You can combine the Manaslu Circuit Trek with the Tsum Valley, a beautiful, secluded valley where century-old Tibetan traditions prevail. 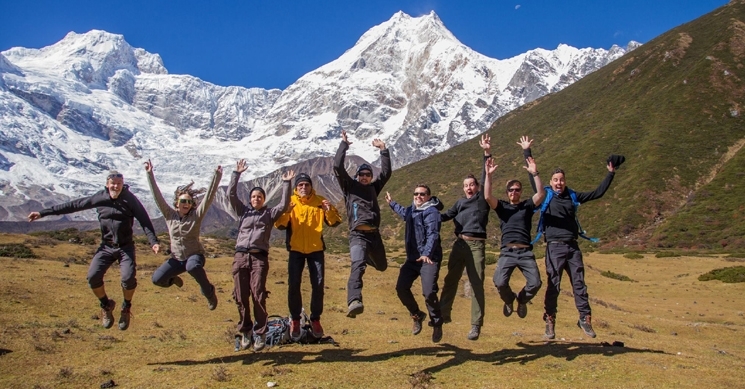 We at Green Valley Nepal Treks and Research Hub have 17 days itinerary for the Manaslu Circuit trek and the itinerary includes your arrival and departure days to and from Nepal. We love to share our knowledge and stories of the region and we are prepared to go that extra mile in order to provide our clients with an exceptional and personal adventure through this magical region of Nepal. Day 10 :Samagaon (rest day) Trek to Manaslu Base Camp or Pungyen Gompa and Birendra Tal. 3 nights standard accommodation in Kathmandu breakfast included. ACAP entry permit (Annapurna Conservation Area Project). Private JEEP to trek start point to end point. If you prefer to use private JEEP to SotiKhola (trek start point) from Kathmandu & Chamche (trek end point) to Kathmandu, it will cost you US$ 300 extra per Jeep. One JEEP could share between 6 people maximum. Tips for Guide and Porter (it is expected). Day 1 :Arrive KathmanduArrival in Kathmandu. Our Airport Representative will meet you at the Tribhuwan International Airport. A drop to the Hotel by private tourist vehicle is arranged. You can either take a rest or meet us at our office and know the detail arrangement of the Trek. B&B at the hotel. Day 2 :Manaslu Restricted area permit preparation and briefing of TrekAfter breakfast, you will be introduced with the trek leader/guide at the hotel. This pre-trip meeting is for briefings on the trek and other necessary details. Please bring along your passport and three passport sized photos and a copy of your travel insurance policy. You can use your free time to rest or explore around for some last minute shopping. Overnight stay in Kathmandu. Day 3 :Drive to Soti Khola (800m) Drive from Kathmandu to Arughat to Soti Khola (710m). Early morning drive to Dhading Bensi, the district headquarter of Dhading and then to Aarughat along rough tracks. At Aarughat we take a bus drive to Soti Khola which is an ideal for a freshwater bath. Overnight stay at Soti Khola in a small village beside the river. Day 4 :Trek Soti Khola to Machha Khola (890m) Soti Khola to Machhi Khola. After we cross the bridge, the trail goes through the green Saal forests. Ascending through a ridge overlooking rapids of Budhi Gandaki leads us to Khursane. The last part is a rocky trail up to the Gurung village, Lapubesi. Then we continue along the riverbank treading on sand and rounded stones and cross a suspension bridge to arrive at Machhi Khola village. Overnight stay at Machhi Khola. Day 5 :Machha Khola to Jagat (1410m) We continue the trail along the river. Ascending and descending small elevations, the trail passes through Tharo Khola, Khorlabesi and and eventually reaches a hotspring - Tatopani. Traversing a ridge and crossing the Budhi Gandaki river, we reach Dovan. We gain elevation which brings changes in view and vegetation alike to reach Jagat. The forest walk could be a surprise meet with Langur Monkeys. Overnight stay at Jagat, a large Gurung village. Day 6 :Jagat to Deng (1800m) The trail begins along a rocky ridge with emerging view of Sringi Himal. We pass through Ghatta Khola and continue to Philim, a Gurung village. Before entering Nupri, we pass through farms growing maize, millet, potatoes and vegetables. Passing through an uninhabited gorge, and walking on the trails at the bank of Budhi Gandaki, we cross bamboo forests to the Deng river. Overnight stay at small Deng village beside the Deng river. Day 7 :Deng to Namrung (2660m) Shortly beyond Deng, the trail climbs to Rena. After passing some houses, the trail elevates high above the river and then drops into the Sringi valley passing numerous Tibetan Mani lined walls and colorful forest before reaching Namrung. The trail has beautiful views of Sringi Himal and crosses the Budi Gandaki river several times. Overnight stay at Namrung. Day 8 :Namrung to Lho Gham (3180m) With stunning views of Sringi, Ganesh Himal, the trek starts from Namrung and climbs steadily into the alpine which is blessed with marvelous mountain views. The village of Namrung marks the beginning of the region of pure Tibetan inhabitants. Passing through forests, villages and barley terraces, the first stunning glimpses of Manaslu gets visible which accentuates at Lho village. We stay overnight at Lho village and enjoy the sunrise and sunset view from the lodge or a gompa. Day 9 :Lho Gham to Samagaon (3530m) We pass through gompas, Tibetan settlement and alpine scenery. After a short trek we reach Sama Gaon where we stop. The retreat is both for rest as well as acclimatization. Its also a day to get acquainted with Sherpa culture and tradition. Set at the foot of the pastures, the village has a distinctive Tibetan architecture which ripens through the 500 years of settlement. Entrance gates to villages are common here, and you can also notice Chinese brandy on sale or see village women weaving wool into gowns. Hike up to a gompa above town or wander the streets of Sama Gaon. Overnight stay at a mountain lodge. Day 10 :Samagaon (rest day) Trek to Manaslu Base Camp or Pungyen Gompa and Birendra Tal.Trek to Manaslu Base Camp or Pungyen Gompa and Birendra Tal. Descending to the Budhi Gandaki river and following it towards the north until we reach a bridge, we take a left and head to the Manaslu Base Camp. Pungyen Gompa is a 3-4 hours hiking and Birendra Tal is a 1 hour hiking, so both can be combined. Day 11 :Samagaon to Samdo (3860m) The Larkya la Trail passes several mani walls in the valley and leads to juniper and birch forests. Descending back to Budhi Gandaki and crossing a small bridge, we climb to 'kane', the entrance to Samdo. A village with 3 valleys converging upon it, Samdo is known for traditional yak herding and it depicts the traditional Tibetan lifestyle - rearing sheep and goats, training horses and planting barley. Day 12 :Samdo to Larkya Phedi (4480m) Pass The walk throught ridges, crossing wooden bridges over Budi Gandaki continues. After crossing two streams, we come across the Larkya glacier after which a dramatic gorge is reached. Upon climbing to 4450 metres, we reach Larke Phedi where we take shelter in a Dharmashala. The walk is short providing plenty of time for acclimatization. Day 13 :Larkya Phedi to Bimthang (3720m) – climb the Larkya La (5100m) A short climb leads us to the north side of Larkya Glacier. The place provides great views of Cho Danda and Larkya Peak. The climb to the Larkya La (5100m) pass is gradual in the beginning but steepens towards the end. Stunning panorama of different ranges can be seen from the pass. A challenging day over the high Larkya La. The steep decent from here is strenuous, but its an equally rewarding experience. Bimthang awaits the end of a tough day. Overnight at a tented camp. Day 14 :Bimthang to Tilje (2300m) With outstanding views of Manaslu, Lamjung Himal, Himlung Himal and Cheo Himal with the inspiring forest and valley below, the descent from Bimthang crosses over high pasture land, Dudh Khola and rhododendron forest. Karche, 2785 metres is the highest cultivated land in the area which leads to a steep climb over a ridge. The village of Gho is a rest option though better lodges are available at Tilje. Day 15 :Tilje – Chamche (1410m) After crossing a ridge and a stone paved trail, we pass throught a beautiful village. Tibetan settlement can be seen along the way. We descend into the Marsygandi Valley and from Dharapani, meet up with the classic Annapurna trail. Walking across Karte village and crossing the Marshyangdi Khola, mani lined walls welcome us to the village of Tal and further move to Chamche. Overnight stay at Chamche. Day 16 :Drive back to Kathmandu via BeshishaharWith terrace fields and villages over the hills, we descend through rhododendron and pine forests to Syange. The drive from here to Kathmandu is mostly along the banks of Marsyangdi and Trishuli rivers and passes through Beshishahar, the district headquarter of Lamjung. In the evening, celebration over the successful completion of the trip is done over dinner. Overnight stay in Kathmandu. Day 17 :Departure from KathmanduA drop from the hotel to the airport 3 hours before the scheduled time of flight is arranged in a private tourist vehicle.